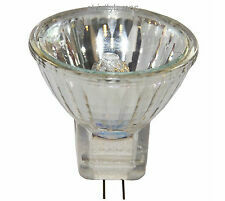 5 x MR16 12v Clear Halogen Light 10watts Bulbs. MR16 GU5.3, 2 pin. Colour temp. Beam angle. Fitted with Integral safety fuse with build in safety on failure end of life. Incandescent Bulbs & Tubes. CFL Compact Fluorescent Bulbs. These bubs are halogen type, When fitting use a piece of tissue paper as. they do not like being handled with bare skin. 6 x MR11 10watts Clear Halogen Light Bulbs 12v. MR11 2 Pin. Fitted with UV- stop protects against harmful UV radiation. Colour temp. Beam angle. Fitted with Integral safety fuse with build in safety on failure end of life. UK Seller 10PCS G4 Warm White Halogen Clear Capsule Bulbs 10W for Table Lamp Range Hood. Fitting type G4. Protective uv-stop glass. 12 Volt 10 Watts. Specifications: Base: G4 Power: 10W Lumen Output : 10W = 100lm Colour Temperature: Warm White ( 2800K) Life span: 1500 Hours Quantity: 10 Feature:Typically used for table lamps, ceiling lights, chandeliers, cooker hoods etc.. Package Included: 10 x G4 Light Bulbs. Power: 10W. 10 x Halogen light bulb. Energy saving, compact size, higher brightness. Bulb life: more than 1500H. Color: warm white. Height: 3cm. Long lasting service life. BLV 181021. Base/Socket GU5.3. Luminous flux 60 lm. They do NOT produce a blue light. Light technical data. Color temperature 4200 K. Average Lifespan & Base. Electrical data. G4 Pins 4mm. Fitted with UV- stop protects against harmful UV radiation. Colour temp. Beam angle. Warm white 3000k. Energy Rated. Fitted with Integral safety fuse with build in safety on failure end of life. 12V 10W MR11 Spots. 12 Volt 10 Watt 35 mm MR11 spotlights. unless stated otherwise. Orders are placed before 2 PM normally.